It’s no secret that a number of city planners, community groups, and developers have had their eyes on the intersection of Main and Danforth for some time now. But while many have been discussing the potential for Main Square, it’s a site across the street from that property that could be transformed. Tribute Communities and Greybrook Realty Partners want to build a 30-storey mixed-use condo on the southwest corner of Main and Danforth, beside the Hakim Optical building and across the street from the towers at Main Square. 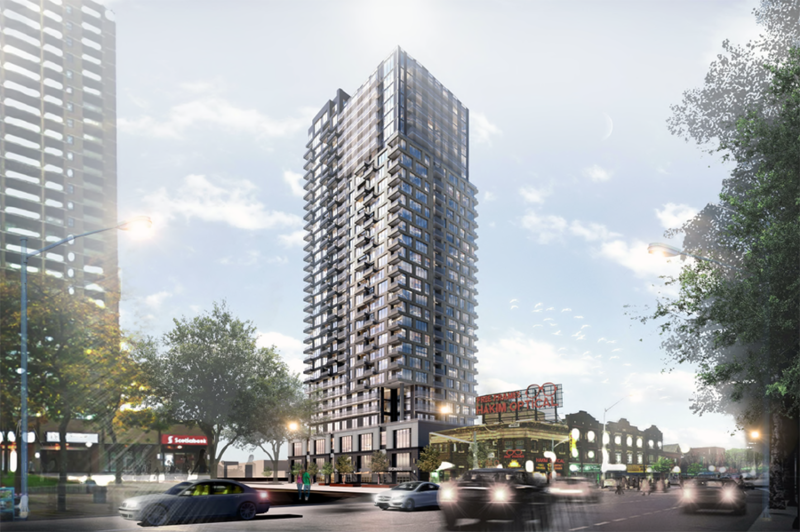 Plans for the proposed development, designed by architect Turner Fleischer, were revealed in early July after a rezoning and site application was submitted to the City of Toronto outlining plans for the site at 286-294 Main Street. “Main and Danforth is an exciting area and Danforth Avenue is an exciting area with lots of growth and change that the city is encouraging, and that’s attracting interest from many stakeholders in the city, developers included,” said city planner Daniel Woolfson. According to Woolfson, the plans are still “very early in the process” and will need to go through a preliminary report process with the city before moving towards a community consultation, which he estimated will likely take place in the fall. The plans to date include a condo with 301 residential units, one floor of office space, and retail on the ground floor. They also include more than 300 bicycle parking spaces, along with three floors of underground parking. If approved, the development will displace several long-term tenants, including Grumbels Deli and a doctor’s office, of four mixed-use buildings ranging in height from one to five-storeys. The plans propose widening a public laneway, which would require replacing the detached home located at 144 Stephenson Avenue. The application points to intentions of improving public space in the area and while the final details are still to be determined, Woolfson said current plans include the addition of landscaping features, wider sidewalks, and modified vehicular access to Stephenson Avenue. According to Woolfson, the city has been seeing an increase in the number of applications that propose improvements to the public realm — an initiative encouraged by the city — but this one noted additional improvements to the area that go beyond the immediate site of interest and would continue to travel north toward the Danforth. The site sits close to the subway and GO transit, and it is also close by an up-and-coming strip of east Danforth, which is home to a number of local businesses, markets and shops. The area is also in the midst of a Danforth Avenue Study, led by the city with participation from DECA’s Visioning Committee and other community leaders. The study aims to gather feedback from neighbourhood committees and communities in order to fuse a local vision for the neighbourhood with new urban development guidelines. Curious to see how this works…since this section of the Danforth is covered under the “Official Plan” as an “Avenue” which only permits 11 floors (depending on street width). I guess this is technically on Main Street and not considered an Avenue so the developer gets away with whatever they want?